Skill of the Month Follow-Up: Send in your photos! Let�s see how everyone�s doing! Have you tried quilting for the first time this month or have you started a new quilting project? Email your photos to admin @thesurvivalmom.com and your photos will be posted on the blog! 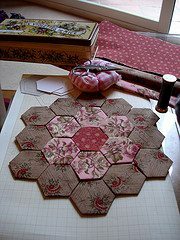 Whether you�re an experienced quilter, increasing your skills, or a newbie just joining the Survival Moms� Quilting Bee, here are a few more ideas for you.� Below you�ll find links to supplies, patterns, and books that you may find helpful.� Feel free to post links and sources you have found helpful.� There�s an endless world of quilting information and ideas! This is one of my favorite patterns.� I made it for my middle sister a few years ago and she absolutely loved it! My post apocalyptic project!� At my sweet husband�s request, I�m ordering the final supplies to have this king-size quilt ready to make by hand.� He loves my quilting so much, he advises on colors and patterns that he likes.� It will be especially special if I have to work on it in a TEOTWAWKI environment! Yes, I actually own and use this book.� It is well written with clear and easy to understand instructions.� It also provides several projects for beginners. Any of Barbara Chainey�s books are good.� She is very easy to understand, provides clear instructions, and her patterns and projects are lovely.� If you are concerned about cutting and piecing blocks making a quilt top, this book has a wonderful section on whole cloth quilting. This is a simple and inexpensive �how to� book.� It covers the basics from supplies to instructions and provides a few projects for beginners.